Liter SIEK received the B.A.Sc. degree from University of Ottawa (OU), Ottawa, Ontario, Canada; the M.Eng.Sc. from University of New South Wales (UNSW), Sydney, New South Wales, Australia; and the Ph.D from Nanyang Technological University (NTU), Singapore. From 1981 to 1983 he was employed in a couple of companies dealing with automation and control. From 1983 to 1985, he was an IC Design engineer with a European semiconductor powerhouse, SGS(now ST Microelectronics), situated in Castelletto, Milan, Italy, where he worked in the central R&D Laboratories for Linear IC, designing ICs for cordless telephone and motor regulator. From 1985 to 1987, he was with the same company situated in Singapore’s Asia Pacific Design Centre, where he was a senior IC design engineer involved in IC design for monolithic power ICs in bipolar technology. 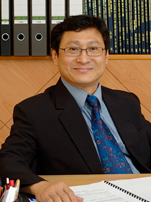 Since October 1987, he has been with Nanyang Technological University involving both in research and academic. He is currently an Associate Professor in the Division of Circuits and Systems and the Director of VIRTUS-IC Design Centre of Excellence in the School of Electrical & Electronic Engineering in NTU. He is also the Director for the Joint NTU-TUM PhD & MSc(IC Design) Programmes. He has received several teaching awards and other awards given by the student body. His research interests are in the design of analog/mixed signal ICs especially in the areas of low-voltage low-power circuits, Power Management circuits, PLLs and Data Converters. In addition, he has authored and co-authored more than 100 international journal/conference technical papers with several patents and has conducted numerous Analog/Mixed Signal IC design short courses for the industry. He is also actively involved in the IEEE SSCS Singapore Chapter. 1. Z. C. Sun, K. W. R. Chew, H. Tang and L. Siek, “Adaptive Gate Switching Control for Discontinuous – Conduction Mode DC-DC Converter”, IEEE Trans. on Power Electronics, Vol. 29, Issue: 3, publication: 2013, pp. 1311 – 1320. 2. Kin Wai Roy Chew, Zhuochao Sun, Howard Tang and Liter Siek, “A 400nW Single-Inductor Dual-Input-Tri-Output DC-DC Buck-Boost Converter with Maximum Power Point Tracking for Indoor Photovoltaic Energy Harvesting”, 2013 IEEE ISSCC International Solid-State Circuits Conference, San Francisco, 17-21 Feb, 2013, pp. 68-69. 3. Kok Foong Chong and Liter Siek, “A PLL with a VCO of Improved PVT Tolerance”, 2011 International Symposium on Integrated Circuits(ISIC-2011), Singapore, December 12-14, pp. 464 – 467. 4. Yoon Hwee Leow and Liter Siek, “A High Speed Tracking Quantizer for Continuous-Time Multi-Bit Sigma Delta Modulators”, 2010 IEEE Asia-Pacific Conference on Circuits and Systems, APCCAS 2010, Kuala Lumpur, Malaysia, December 6-9 2010, pp.776-779. 5. Howard Tang and Liter Siek, “An Energy Recovery Approach for a Charge Redistribution Successive Approximation ADC”, 22nd IEEE International Conference on Microelectronics (ICM 2010) Cairo, Egypt, 19-22 December 2010, pp. 13-16. 6. Ahui Sun, Meng Tong Tan and Liter Siek, “Segmented Hybrid DPWM and Tunable PID Controller for Digital DC-DC Converters”, 2010 International Symposium on Next-Generation Electronics (ISNE), Kaohsiung, Taiwan, 18-19 Nov. 2010 , pp. 154 – 157. 7. Kin Wai Roy Chew and Liter Siek, ” Single Inductor Quad-Input-Dual-Output Buck Converter for Photovoltaic Systems”IECON-2010, 36th Annual Conference of the IEEE Industrial Electronics Society 7-10 November 2010, Phoenix, AZ, USA, pp704-709.